Hepaclin Granules for solution: Each sachet contains L-Ornithine L-Aspartate INN 3 gm. Hepaclin Injection (Infusion Concentrate): Each 10 ml injectable solution contains L-Ornithine L-Aspartate INN 5 gm. Hepaclin is a stable combination of two important endogenous Amino Acids, L-Ornithine and L-Aspartate. After administration, it quickly breaks down into L-Ornithine and L-Aspartate. L-Ornithine being a substrate of urea cycle, converts toxic ammonia into non-toxic urea which is eliminated via kidneys, helping the diseased liver to carry out its normal function smoothly (detoxification). The process lowers the elevated level of ammonia in blood (hyperammonemia) which is a common problem in most of the liver diseases. L-Aspartate is an essential component of citric acid cycle which liberates energy (ATP), and thus helps in regeneration of damaged liver cells. 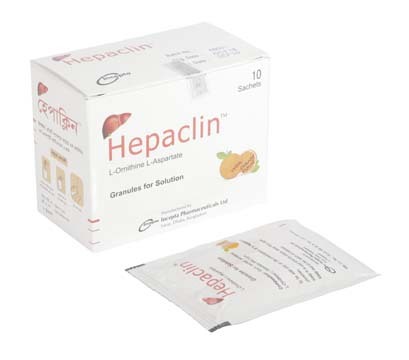 Hepaclin is indicated for the treatment of Hepatic Encephalopathy, Acute Liver Failure, Hyperammonemia due to Acute and Chronic Hepatitis, Fatty Liver, Alcoholic Liver damage, Adjunct to hepatotoxic drugs, Liver Cirrhosis, Post hepatitis convalescence etc. Sachet: 1-2 sachets of Hepaclin granules is dissolved in a large amount of fluid (e.g. in a glass of water or juice) and is taken orally 3 times a day during or after meals. Injection (Infusion Concentrate): The recommended dose is up to 20 gm (4 ampoules daily). In case of loss of consciousness (pre-coma) and clouding of consciousness (coma) up to 8 ampoules within 24 hours, depending on the severity of the condition. 2) The normal dilution rate is 1 ampoule per 100 ml of I.V. fluid. However, the dose should not exceed 6 ampoules per 500 ml infusion. The solution mixtures were stable up to 24 hours. 3) Infusion Rate: 5 gm/h at maximum. Very rarely side effects like nausea and vomiting occur. These side effects are usually transient and do not necessitate the withdrawal of the drug. Monitoring of serum and urinary urea levels at regular intervals should be done. The administration in pregnancy and lactation should be avoided.